Welcome to the Dragon’s Peak, a look at the latest in upcoming games! Here’s what we’ll be looking at this month. I’m a sucker for dawn of civilization discovery and exploration games. 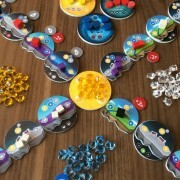 Martyn F created one of my favorite puzzle games, Cities (recently rethemed as Limes), and I’m very excited to see what he can do with the genre. 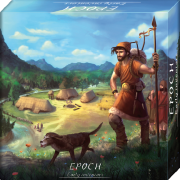 Epoch uses different terrain tiles to introduce technology into the game as players explore. The Kickstarter was recently canceled to allow for more time developing a better graphical experience. I’ll be watching closely for this one in the future. Plaid Hat Games is preparing their newest expandable game system from Isaac Vega (Dead of Winter, City of Remnants). 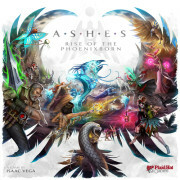 Take on the role of a Phoenixborn and go head-to-head against your opponent with beautiful illustrated spells and allies. 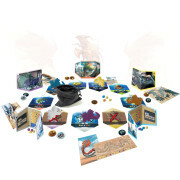 There are plenty of custom dice and a unique system that lets you select your starting hand. I feel like I’ve been seeing more euro-style games boasting very fast play times. 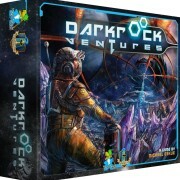 Darkrock Ventures is a mining game that utilizes dice manipulation in a lightning fast 30-45 minutes. 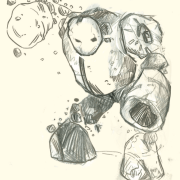 Up to 5 brave mining teams can send out their workers to harvest a mineral rich asteroid and face the threat of alien invaders. 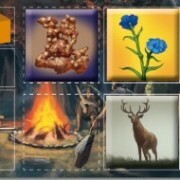 The player that can best extract and export these resources will be victorious. One of my most highly anticipated games for the coming year is J. Alex Kevern’s Gold West. 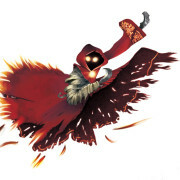 Now I have a second title to look forward to from this guy. 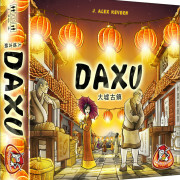 The 2-player Daxu puts a twist on competing for sets by rewarding players for having smaller majorities and punishes them for having too much. This sounds like it will make for a very tense game as players can decide whether to keep the cards that come out each turn or give them to their opponent to influence these majorities. 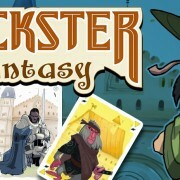 Definitely one to keep an eye one if you enjoy interactive and quick playing 2-player games. Back in February we got our first glimpse at the beautiful world of Uma-Jirushi. 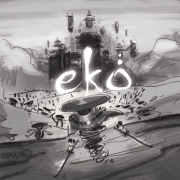 It has now been renamed ekô and we’ve been given a sample of the artwork from a few of the four distinct clans. 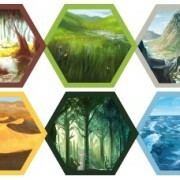 There’s also promise of a modular board to increase replayability for this minimalist fantasy abstract. I looked at ExoPlanets way back in December of last year and we finally have a rulebook and some videos or it in action to go along with their Kickstarter campaign. I’ve been following the Board & Dice team along their journey and their passion for making games is commendable to say the least. 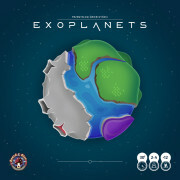 ExoPlanets is particular reflects their desire to bring themes to life through unique gameplay. 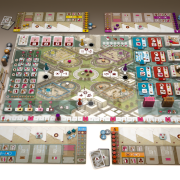 Vital Lacerda has quite an impressive catalog of heavier euros (Vinhos, Kanban, CO₂) and is looking to release his next endeavor on Kickstarter this summer. 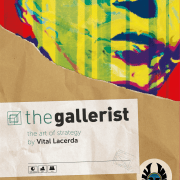 The Gallerist offers a unique theme of being a museum curator and art dealer accompanied by appropriately beautiful and colorful artwork. These a great trailer for anyone interested in whetting their appetite. 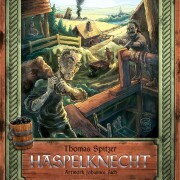 Those looking for games about historical mining won’t have to look any further than Spitzer’s trilogy (most notably containing Kohle & Kolonie) which will be conclude with the release of Haspelknecht. It looks to be the lightest game in the series and recently changed hands from Spielworxx to Quined Games. It seems like people have been asking about what the next faction for Imperial Settlers would be since it premiered at Gen Con last year. After getting a small expansion to hold us over in the mean time we finally have a first taste of the fifth faction that will join us again at Gen Con, the Atlanteans. 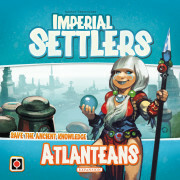 There’s not much information right now but at least we can rest easy knowing that more Imperial Settlers is on the way! 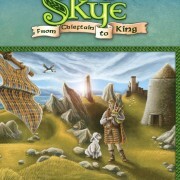 This fast playing tile laying game has players building their own kingdom to fulfill 4 of a possible 16 scoring cards. 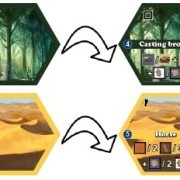 What makes things interesting is that you’ll be purchasing tiles from each other at prices set by the players each turn. Lucrative pricing will provide the wealth you need to build a prospering kingdom but if you set them too high then you’ll end up with nothing. 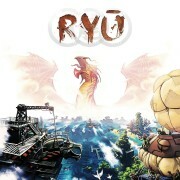 I got a chance to play an early copy of RYU back at Gen Con last year and was immediately drawn to the breathtaking artwork and unique resource gathering system. The players are competing to collect the resources necessary to be the first to construct their gorgeous mother ship. 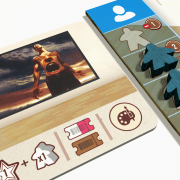 Lookout Games has a very reliable history of bring us fantastic 2-player games. 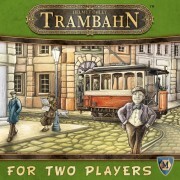 Trambahn is the latest offering that offers a personal favorite multiple-use-for-cards drafting system to allow players to build a successful tram line. The card are wonderfully illustrated with charming art from the 19th century Munich setting. I’ve been steadily building up a collection of great small box 2-player games and am looking forward to adding this one as well! 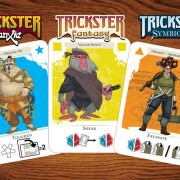 Trickster sounds a bit like a traditional card game but it has several twists that make it stand out. First, players are trying to collect the fewest cards over the course of the game but may ignore any suits in which you have the most. 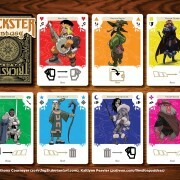 Second, each round has a unique play pattern set by the second player (referred to as the Trickster). If someone can’t follow the pattern (same suit, same hero, etc) they must take the cards. 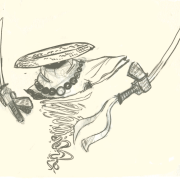 If everyone plays successfully then the trickster takes them. Additionally, each card has an ability that gets used when the card is played allowing players to manipulate various areas of the game. 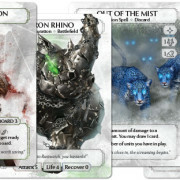 Daniel Solis is currently seeking feedback for a free Print and Play for anyone that’s interested. 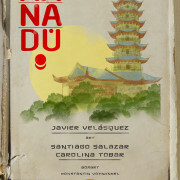 Quined Games recently picked up the 2012 release, Xanadú, as the first game in their small box line. 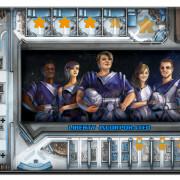 It’s an interactive card games where player construct buildings that can be used by everyone utilizing workers which are also represented by cards.